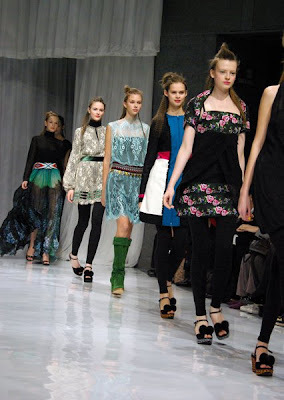 Designer Han has been presenting her collections at Japan Fashion Week since 2003! Her pieces are representative of "POP LIFE" and combine a "daily elegance and vivid passion." Her pieces are "for beautiful, elegant women who are strong but soft, cool but cute." For more information visit her site here. The white runway was covered in plastic which was removed right before the show. This reinforced the idea of new and fresh, like the collection. This Autumn and Winter exhibition could easily work for Spring, as well. There were lots of whites and pastels, sleeveless tops and vests, shorts and short skirts. Many of the high heeled sandals and wedges matched the outfits. More fur embellishments and trims here! Vibrant blues and greens were prominent and could definitely function well throughout the year. The oranges and reds, against the white background, gave this collection an Eastern European flavor. The designs on the belts and dress panels looked as if they were embroidered. Coin belts and necklaces fit right in with the peasant blouses, soft suede boots and swinging, flouncy skirts. These were "the many costumes of the world - a new, little world." Images by Luke the Photographer! Nice - I'm really digging this ethnic feel. So unboring! I'm liking the muti cultural ethnic detailing coming through in this collection. hope your well Anthea.